On Sunday, HRC Foundation’s fifth-annual Time to THRIVE Conference in support of LGBTQ youth came to a close. The annual event is held in partnership with the American Counseling Association and the National Education Association, with AT&T, BBVA Compass and Toyota as presenting sponsors. The HRC Foundation’s premier national event addresses safety, inclusion and well-being for LGBTQ and questioning youth, and brings together youth-serving professionals to discuss best practices for working with and caring for LGBTQ youth and their faimilies in schools, community centers, health care settings and beyond. After attending their final breakout workshops and training sessions, the Time to THRIVE contingent heard from Chris Mosier, the first transgender member of Team USA, during the closing plenary. Mosier spoke to the importance of LGBTQ inclusion in sports, and affired LGBTQ youth that it is possible to be themselves and compete in the sports that they love. 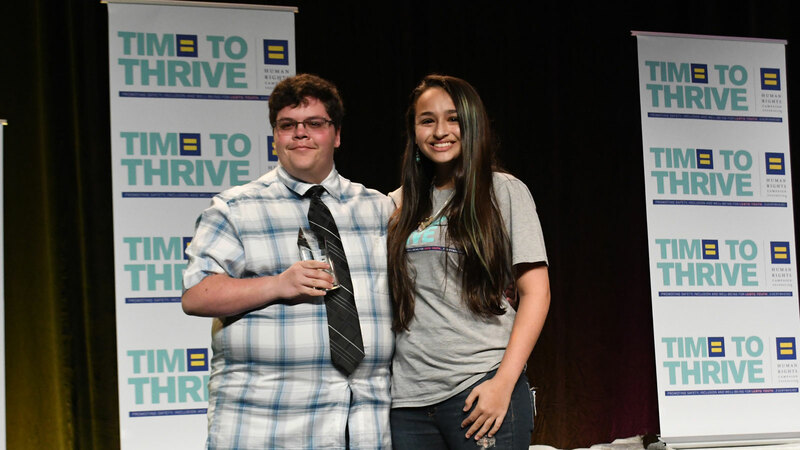 HRC Foundation was honored to present transgender trailblazer Gavin Grimm with its final Upstander Award of the weekend for serving as a leader for LGBTQ youth everywhere and taking his fight for equality all the way to the Supreme Court of the United States. Star of TLC’s “I Am Jazz” and 2017 HRC Upstander Award recipient Jazz Jennings presented the award to Grimm. Lastly, attendees were introduced to the 2018 class of HRC Youth Ambassadors as HRC’s Sarah McBride closed the program. Time to THRIVE is the premier national convening of educators and youth-serving professionals to build awareness and cultural competency, learn current and emerging best practices and gather resources from leading experts and national organizations in the field. Time to THRIVE took place Feb. 16-18, 2018 at the Hilton Orlando Bonnet Creek in Orlando, Florida. Read our Time to THRIVE Day One and Day Two recaps.